Today I am going to be talking about the Lotus Wand in the Tradition of The Golden Dawn. The Lotus Wand is one of the main tools of the Magician in this system of Magick. All wands used in Magick symbolize the Will of the Magician who is using them and the Lotus Wand is no exception. Another type of wand that is very similar to the Lotus Wand is the Rainbow Wand, also used in the tradition of The Golden Dawn. The Lotus Wand has the colour white at one end, which is the top and the colour black at the other end which is the bottom. The colour white is symbolic for pure spirit from the Divine source, Kether going by the Kabbalah. The colour black is symbolic for the earth, Malkhut going by the Kabbalah. These two ends of the wand can also be seen as Light and Darkness and so forth, the two poles or pillars going by the Kabbalah. So as you can see these two ends of the wand have different meanings. As you may know, Kether and Malkhut are not represented on the two outer pillars of the Kabbalah in which the two ends of the wand also represent, but are represented on the middle pillar. The two outer pillars of the Kabbalah also stand for the Left and Right Hand Path or Negative and Positive, as does each end of the Lotus Wand. In between the black and white coloured ends of the Lotus Wand are twelve different colours. These twelve different colours represent the twelve Signs of the Zodiac and also the Planets, as Planets are always in different houses of the Zodiac. Depending on what spiritual work, I as a Magician are doing, is to where I hold the Lotus Wand. If say I am working with the Planetary Forces, example a Entity connected to a Planet, as different Entities govern different Planets. I would hold the Lotus Wand at the colour that represents the Zodiac in which the Planet was in at the time of the spiritual work been done. 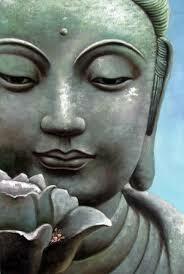 On top of the Lotus Wand is the Lotus Flower, the flower is white as again it is symbolic for Spirit. In the middle of the White Lotus flower the colour is Amber which is symbolic for the Sun as the Golden Dawn is a Solar tradition of Magick. Also in the middle of the White Lotus flower is four Orange Petals which are symbolic for the Suns rays upon the Earth which gives Light and Life to all. With the Lotus Wand there are Ten Petals that represent the Ten Sephiroth, Spheres on the Tree Of Life, Kabbalah. Then there are Eight Petals on the next layer which represent the natural and spiritual forces of the Elements of Air and Fire. Then there is another Eight Petals on the next layer which represent the natural and spiritual forces of the Elements Earth and Water. The White Lotus Flower is also a symbol of the Egyptian Goddess Isis. The Lotus Flower opens up at The New Dawn which is symbolic for Renewal and New Beginnings or Magical workings. The Lotus Flower creates Air, giving off Oxygen that all life here on Earth needs to breathe. 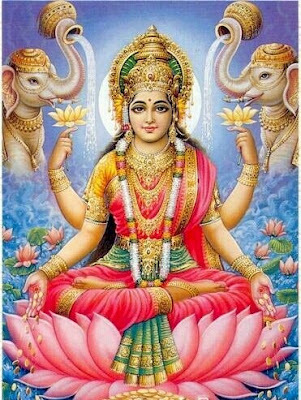 So also it can be seen that the Lotus Flower has a connection with the Element of Air for this very reason. 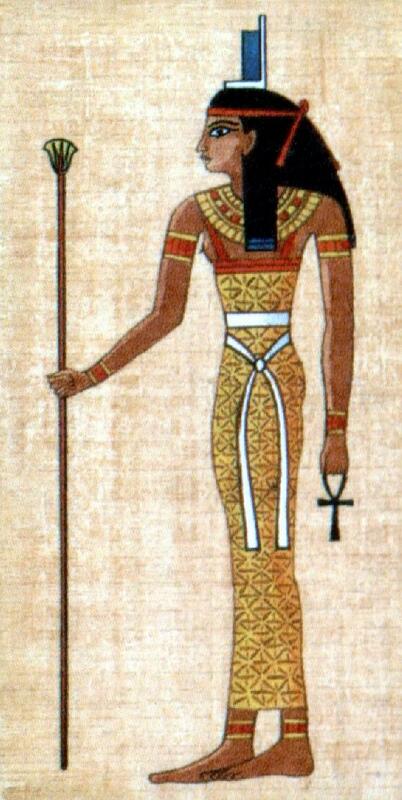 There are many Egyptian paintings which show Egyptian Goddesses and Isis holding the Sacred Lotus Wand in their hand. Not only in the ancient Egyptian religion does the Lotus Flower have great symbolic meaning, but also in Buddhism and the Hindu religion and more. As an example the Chakra System in our Astral bodies looks like the petals of a Lotus flower. I will leave it for the reader of this article to go into a more deeper study of the spiritual symbolism behind the Lotus flower and it`s individual petals. As I have said before in other articles of mine, it is so much better to make your own Magical tools. Some of the reasons are, when you are making the tools your energy and concentration is going into it. If you are new to esoteric principles, this can be good practice as concentration and focus is crucial in order to get the results you wish. Not only this but while you are making you spiritual tool you are to some degree charging it and empowering it. Your Magical tool will be all the more special to you and feel like a part of you, which it should if you make it yourself. I recommend also that after you have made what ever Magical tool you are making, that you should sleep with it for a few nights. Then you should rap it in a white cloth where no one can touch it, as that is important. The only person that should touch any of your Magical tools is you. Other people are free to look at them, however they may not touch them. The length of the Lotus Wand should be around twenty five to forty inches, I prefer to have my Lotus Wand to the shorter length in order to fit it on my Magical Altar. Also while you are doing a spiritual working, you should not touch the Lotus flower at all. The Lotus Wand should remain up right at all times, meaning that the Lotus Flower should be at the top when holding it or facing to the East on your Altar. Never under any conditions turn your Lotus Wand upside down. If you are using your Lotus Wand for Banishing then you may hold the Lotus Wand by the Black colour. 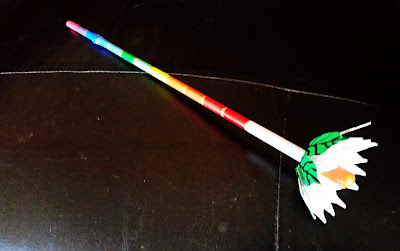 If the you are using your Lotus Wand for Invoking/Evoking then you may hold the Lotus Wand by the White colour or even use the White colour for Banishing as well. When dealing with Material things use the Black colour, when dealing with Spiritual things, use the White colour. Hold your Lotus Wand with two fingers underneath and your thumb on top. Your thumb is on the colour you are using and so is your two fingers underneath. 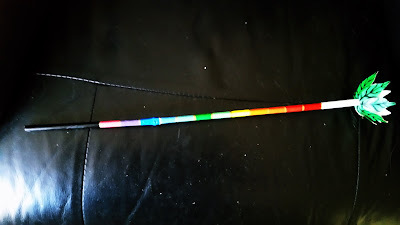 This is why when making your Lotus Wand, have the coloured sections wide as to fit your fingers and thumb in it. I also have hand painted silver rings separating each colour. Before using your Lotus Wand it must be consecrated first to activate it. Thanks for taking the time to read through this article of mine and I hope that it has been helpful to you. If you have any questions in regards to this article, please feel free to leave a comment below, also please share with others thanks.